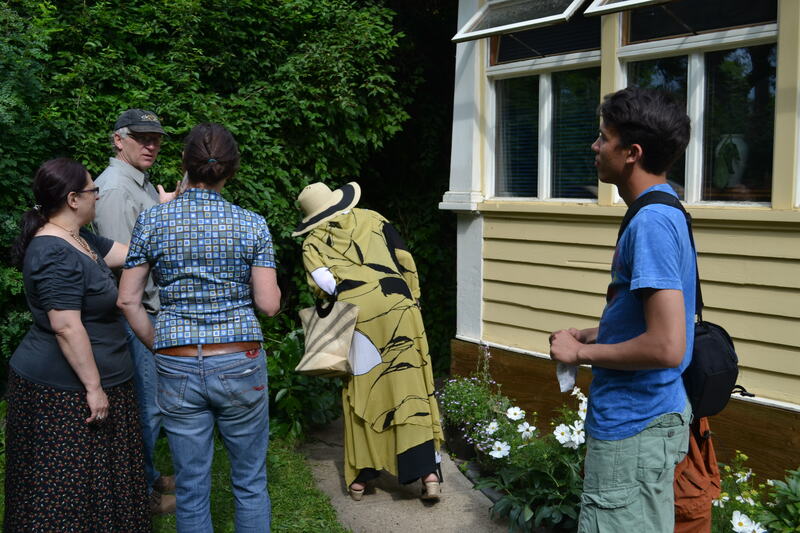 Some of the folks out at last weekend’s Backyard Gardens walk. I’ve had some time on my hands this summer to brew a couple new projects, and I think one of them is ready to open up a bit to the world. It’s called Shareable Neighbourhood. Well, it wasn’t always called Shareable Neighbourhood. Technically this is the first time that’s ever happened. Initially I just called it Neighbourhood Walk, and between the two names you kind of get the idea: monthly tours of our neighbourhood in Old Strathcona/Mill Creek, to let people share what they know about local history and nature. It was an idea born out of Next Up, the leadership program I finished this year. I’d been trying to dream up ways to get people jazzed about the nitty-gritty of where we live. Partly because I’m intensely curious about how and why things got to be the way they are, and partly because I think when you know more about what’s in your soil and who’s lived on it, you’re more likely to stand up for it. And partly I hoped that if we were all learning and sharing this stuff together more often, we’d feel like we had a more natural community of people to turn to when we need help getting a group solar panel discount, or bringing people out to a city council meeting — you get the idea. The twist is that while we’ve had three so far and it’s ready to be murmured about online, it’s also young and needs fresh minds. I’m really trying to encourage folks in the neighbourhood to feel confident leading their own walks, even if they don’t have a degree or letters behind their name to qualify them in the idea. That’s why last weekend’s theme was Backyard Gardens: six of us who aren’t professional horticulturalists got to show off what we know about making tomatoes and delphiniums look good. So I want to decentralize the planning behind this as soon as possible, and we also need theme ideas. So if you’re reading this, and you live in and/or know a lot about Edmonton’s Old Strathcona and Mill Creekish areas, drop me a line. If you have a tour you’d like to lead, great! We’ve done Plants of the River Valley and History of Immigration to Edmonton so far, and I think this month we’re going to investigate the local railways. And if you’d like to get involved in organizing, I’d love to hear from you too. Shareable Neighbourhood also has a Facebook group if you want to join. It might need to become a likeable page at some point. By the way, this project owes a lot to the Jane’s Walks. They’re these annual walks all around the world that work exactly this way. Locals lead walks around topics like how an industrial heart became an urban park. I didn’t even realize how inspired I was by Tim McCaskell’s tour of Toronto’s gay village until someone pointed it out to me. Also the name change was inspired by the great podcast 99% Invisible, which has much the same mission to explore the unseen story behind everyday parts of our lives. They tell beauteous stories about everything from how a picture gets on a stamp, to why US currency is so ugly, to how a Walt Whitman poem became wrought in an iron fence in Brooklyn. Just listening to the host, Roman Mars, this week made me more pumped about getting people to show off these unseen stories right beneath the surface of where we live. I highly recommend you check it out.